Defending champion Valverde beats Alaphilippe and Albasini to the line atop the Mur de Huy to take another Flèche Wallonne title. 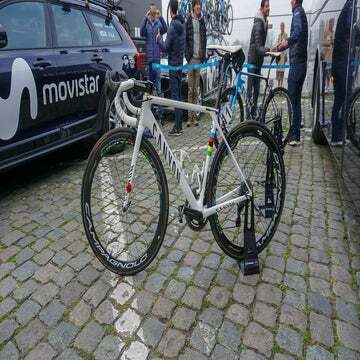 Defending champion Alejandro Valverde (Movistar) crossed the Mur de Huy finish line first in the 2015 edition of La Flèche Wallonne, adding this year’s title to a palmares that already included wins in the 2014 and 2006 editions. 22-year-old Julian Alaphilippe (Etixx-Quick-Step) and Michael Albasini (Orica-GreenEdge) took second- and third-place, respectively. Valverde’s Movistar squad spent many of the day’s 205.5 kilometers at the front of the peloton setting a strong pace to keep the morning breakaway within reach. Seven riders broke clear around 10km into the race and built up a maximum lead of eight minutes, with the efforts of Movistar and of Joaquim Rodríguez’s Katusha teams keeping the move in check. Ahead of the first of three ascensions up the brutal Mur de Huy climb with 85km still to ride, 2014 runner-up Dan Martin (Cannondale-Garmin) went down in a crash and was forced to chase back on with two teammates. However, 2011 winner Philippe Gilbert (BMC Racing) was not so lucky, crashing out of the race in an innocuous-looking incident with around 50km to go. 30km from the finish, Jelle Vanendert, sixth in last year’s race, hit the tarmac and was also forced to abandon. Soon after, Luis Leon Sanchez (Astana) and Giovanni Visconti (Movistar) attacked off the front of the peloton at the top of the second ascension of the Mur, with the remnants of the breakaway not far up the road. The pair quickly overhauled the breakaway riders and left them behind, although their lead over the peloton, led by Katusha and Michal Kwiatkowski’s Etixx-Quick Step team, hovered under half a minute. There was still time for another crash, as Chris Froome (Sky) hit the deck hard and shredding his shorts, although he was able to get back onto his bike. As the peloton reeled in the riders up the road on the Côte de Cherave, just five kilometers before the final ascension of the Mur, Vincenzo Nibali (Astana) tried to jump off the front of the pack, but the Italian was unable to create any separation. Tim Wellens (Lotto Soudal) then made an attempt to get clear with only Giampaolo Caruso (Katusha) able to react. Wellens opened up a small gap, and Caruso put in several minutes of effort trying to bridge, but both were eventually reeled in. A thinned out but tightly marshaled peloton climbed the Mur de Huy in a mostly compact bunch without any riders opening up much of a gap in the steep sections. Valverde hit the front in the final few hundred meters and Alaphilippe and Albasini sailed past former winners Joaquim Rodríguez and Daniel Moreno (Katusha) to contest the win, but Valverde took the day’s victory convincingly. Amstel Gold Race winner Michal Kwiatkowski finished outside of the top ten. Tim Wellens, whose late attack survived into the final kilometer but who was ultimately swallowed up at the base of the Mur de Huy, came away from the race with a positive outlook to take into the weekend ahead. Many of the day’s top finishers will stay in Belgium through the weekend to take on Liège–Bastogne–Liège, the finale of the “Ardennes classics,” on Sunday. Information from AFP was used in this report.